JONATHAN FERRARA GALLERY is proud to announce, Strike Anywhere, an exhibition of the latest work by artist SKYLAR FEIN in his ongoing ‘Giant Metal Matchbook’ series. The exhibition will also feature a special presentation of the artist’s collaboration with New Orleans street artist MRSA entitled Children of the Night. The exhibition will be on view Wednesday 1 April through 30 May 2015. The gallery will host first Saturday artist receptions on 4 April and 2 May from 6-9pm. Fein is best known for his large-scale installations, including Remember the Upstairs Lounge, an exhibit during Prospect.1 that threw a spotlight on a little-known chapter of history. The 1973 arson fire at a gay bar in the French Quarter is still the deadliest attack against gay people on record. But here, in Strike Anywhere, the Bronx-born artist turns to something on a more intimate level. ‘Children of the Night’ is a collaboration between Fein and New Orleans street artist MRSA, member of several local graffiti crews including: Young Rectums, Tweenz Kult, and Illegal Trouble. The two artists have actually worked together for years, but this is their first outing of any kind on a gallery wall. Here they make wood reliefs that run from mythic and figurative to formal and starkly abstract. The work reflects MRSA’s interest in the “fantastical” with content from “all persuasions of mythology -- Greek, Christian, Roman, Nordic and more.” In his graffiti, he starts with myth, then "adds chaos to disrupt the known patterns.” The mash up between the graffiti artist’s oddly classical inspiration and the studio artist’s oddball-outsider methodology is a pleasing one, and we expect this brief experiment to yield more fruit with time. In the fall of 2008, his Prospect.1: Biennial installation, "Remember the Upstairs Lounge," shined a spotlight on an overlooked piece of New Orleans history: a fire that swept through a French Quarter bar in 1973, killing everyone inside. The worst fire in New Orleans history has never been solved. His installation walked visitors right through the swinging bar doors, and offered visual riffs on politics and sexuality circa 1973. The piece was praised in ArtForum, Art In America, The New York Times Magazine and The New Yorker, among others. In late 2009, Fein had his first solo museum show, "Youth Manifesto," at the New Orleans Museum of Art. The exhibition was an ode to punk rock as a force for social and cultural upheaval. True to form, the opening reception was shut down by police responding to the look of the unlikely art-going crowd. In March 2010, Jonathan Ferrara Gallery presented Fein's solo installation, “Skylar Fein: Rise of the Youth Front" at VOLTA Art Fair in New York during Armory Week. This installation drew thousands of people and delved into revolutionary politics past and present, a continuing theme in Fein's work. In May 2010, Fein was invited by the New York curatorial project No Longer Empty to recreate his "Remember the Upstairs Lounge" installation in a vacant Chelsea space. The exhibition, once again, drew thousands of visitors and sparked renewed interest in this piece of history. In September 2011, Fein exhibited over eighty new works in his solo exhibition Junk Shot at Jonathan Ferrara Gallery, New Orleans. This exhibition embodied this artist’s turn towards formalism and art historical reference while maintaining Fein’s iconic sensibilities and aesthetic. Fein's solo exhibition "Beckett at War" in September 2012 at C24 Gallery in Chelsea was praised by The Village Voice as one of the top ten exhibitions of the year in New York. He then followed up with his November 2013 installation of "The Lincoln Bedroom" which received wide media attention. 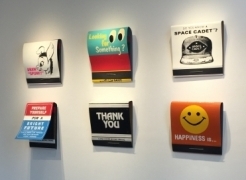 Fein unveiled his “Giant Metal Matchbook” series in his 2014 solo exhibition at Jonathan Ferrara Gallery. Since then, the series has been exhibited nationally at art fairs such as, Miami Project for Art Basel Miami Beach, Texas Contemporary, and artMRKT San Francisco, and has continued to gain momentum in rave reviews and collector acquisitions. Skylar Fein was the recipient of a 2009 Joan Mitchell Foundation Award and his work is in several prominent collections including The Whitney Museum of American Art, The Brooklyn Museum, The Frederick R. Weisman Art Foundation, The Louisiana State Museum, The Birmingham Museum of Art, the New Orleans Museum of Art, curators Dan Cameron and Bill Arning, and collectors Beth Rudin DeWoody, Lance Armstrong, Lawrence Benenson, Brooke Garber-Neidich, Stephanie Ingrassia and Thomas Coleman. For more information, press or sales inquiries please contact gallery director, Matthew Weldon Showman, at matthew@jonathanferraragallery.com.